There it was on the front page of The Globe and Mail: $5.2-billion [in] total spending cuts. The Toronto Star screamed: Tories slash spending in fiscal overhaul, while CTV proclaimed: Budget to cut spending nearly $6-billion. Perhaps they read a different budget than the one we found on the Department of Finance's website. Here's what the Conservatives' budget actually stated: The results of the government's review of departmental spending amount to roughly $5.2-billion in ongoing savings. That's savings, folks, not cuts. On Tuesday, Ontario Finance Minister Dwight Duncan had one of those rare opportunities of which politicians can only dream. With his province heading toward a fiscal crisis caused by mounting debt and out-of-control spending, an opposition sympathetic to dealing with the problem, a public that clearly wants his government to address the debt, and news outlets that understand the need for significant fiscal restraint, everything lined up for Duncan. With economic uncertainty lurking around every corner, its critical that governments across Canada show fiscal discipline and put forth prudent budgets. On Monday, Finance Minister Jim Flaherty held his traditional pre-budget consultation with a number of private-sector economists, who all appear to be predicting improved growth in the Canadian economy for the coming year. This no doubt comes as welcome news to the Finance Minister, as he prepares to unveil his next budget on March 29. But the Finance Minister should not be swayed by these optimistic growth projections; he needs to bring in a budget that will take serious aim at balancing the nation's book. 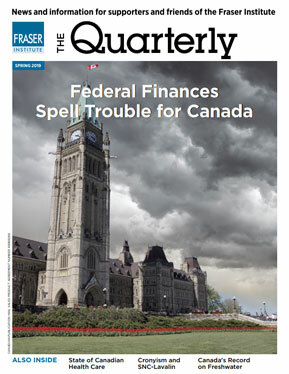 When Finance Minister Jim Flaherty announced last week that the Conservative government will miss its target for balancing the budget, he confirmed something that should be obvious to all students of recent Canadian economic history: Crossed-finger revenue forecasts and unrealistic spending growth projections are no basis for sound economic policy. With the release of its economic and fiscal update, the Conservative government finally confirmed it will not meet its 2014-15 target for balancing the budget.